Warnings from the British Foreign Service and the U.S. State Department notwithstanding, Kashmir is seeing tourist return, although they’re primarily from the region. Two years ago, the old city in Srinagar was the sort of place police would only venture into wearing full body armour. A stronghold for violent separatists agitating for an independent Kashmir, it was the centre of ugly uprisings that left more than 100 people dead, buried along with dreams of peace in the mountainous north Indian region. How quickly things change. This week, carefree tourists lined up in the same streets for barbequed mutton tikka and steaming plates of rogan josh. The Nowhatta mosque, where in the summer of 2010 youths would gather after Friday prayers to lob stones at the security forces (an episode commemorated in graffiti on a nearby wall declaring the area Srinagar’s Gaza Strip), is to become a stop-off on an official walking tour focused on heritage, crafts and markets. Siri Sharada Devi Temple, Sharada, Kashmir. Photo by Irfan Ahmed. Down by Dal lake, houseboats, like the ones in which George Harrison once stayed, have been booked out months in advance. In the stunning mughal gardens lining the lake’s green slopes, visitors have their picture taken against one of Asia’s prettiest backdrops. Until the snow melted, the ski resorts in nearby Gulmarg were packed with rich Russians too. 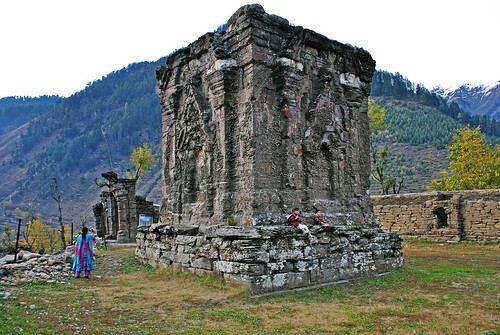 In 2008, just 22,000 tourists dared to visit the Kashmir Valley, frightened off by the anti-Indian insurgency, which has claimed up to 70,000 lives since erupting in 1989. So far this year, according to official figures, the area has received just under one million holidaymakers – more than 23,000 of them from outside India. But fewer than 150 Britons were among them – largely thanks to the UK’s Foreign Office refusing to amend its somewhat hair-raising advice, which deters most travellers by providing a laundry list of recent security incidents in the region, including two grenade attacks in the last fortnight. “Be aware that the level of consular assistance that we can provide in Jammu and Kashmir is extremely limited,” runs the chilling warning. “When did you last hear of a foreign tourist being targeted here?” he asked the Guardian in an interview at his residence in Srinagar, the state’s summer capital, on Tuesday. The last publicised case of foreign tourists being murdered in J&K was in 1995, when six westerners including two Britons were kidnapped by Al-Faran, a Kashmiri militant Islamist group. Only one escaped with his life. “You’ve had British citizens killed more recently in countries that you still haven’t stopped people from visiting. I mean, how many British citizens did you lose in 9/11? Did you stop people from visiting New York? You’ve lost them in Spain, in Bali, tell me where you haven’t lost them,” said Abdullah. Germany relaxed its guidelines for those thinking of travelling to the region last year. “Foreigners are generally not direct targets of clashes,” counselled the Germans’ amended advice. At the time it was viewed by many outsiders as a bold move, coming less than a year after the 2010 disturbances finally died down. A nationwide bank holiday on Wednesday marked 65 years of Indian Independence – traditionally a day fraught with peril in a state where so many still do not feel part of the world’s biggest democracy. Two years ago, Srinagar celebrated Independence Day under military rule, after Abdullah called in the army to quell protests for the first time in two decades. A strict curfew had been in place for several months and on the day itself a policeman hurled a shoe at Abdullah as he was taking the salute at the official function at the city’s Bakshi stadium. At India’s independence celebrations on Wednesday, the mood in the stadium was quite different. The empty seating suggested locals are some way off celebrating their state’s role as part of modern India, but there was no trouble either. Wearing a lambskin karakoli cap and crisp white tunic, Abdullah stressed his commitment to tackling pockets of militancy, and saluted as bagpipe-playing troops marched by to a jaunty Urdu classic. Kashmir is becoming less militarised, he insisted the previous day. Forty military bunkers have been removed from Srinagar, he said, and a number of paramilitary battalions have been sent packing after proving surplus to requirements. He admitted the scale of the security presence in the state could be off-putting: gun-toting soldiers man checkpoints and roadblocks on roads throughout the state, so much of which is still out of bounds behind barbed wire. But he insisted the oft-quoted figure of half a million soldiers – one for every 24 citizens – was wide of the mark. Yet Abdullah freely admitted this week that normality was “quite a long way off”. In April, he talked of withdrawing the much-hated Armed Forces Special Powers Act from certain areas. This controversial law gives unbridled powers to the security services, allowing them to kill with legal immunity. But following a number of militant incidents – such as on 31 July, when three people were injured, including a policeman, in two grenade attacks on a police station and market in Sopore – this has been put on the backburner . The chief minister insists tourists are safe in the state, “as long as you take the sort of precautions that one normally would”. In other words, do not go trekking near the Line of Control, the highly sensitive de-facto border that separates the Indian and Pakistani-controlled parts of J&K, and avoid flashpoint towns such as Sopore. Some visitors may worry about the ethics of having fun in a place with a population suffering from record levels of anxiety and mental health problems – and balk at politicians encouraging tourism when so many painful issues are left unaddressed, such as the discovery last year of thousands of unmarked graves. But all the locals the Guardian spoke to in Srinagar this week were wholeheartedly in favour of tourism. Amjid Gulzar, 26, a geopolitics student whose family has run a tailors business in the city since 1842, said Abdullah could search for truth and reconciliation as well as encouraging foreign visitors. “He must do both, but without tourism, our economy will be in chaos,” he said, adding that while he welcomed the million tourists who visited this year, Kashmir had to do more to attract big-spending visitors, especially foreigners. “We need better infrastructure, better roads, reliable electricity. We need more for tourists to do in the evening – we don’t even have one cinema in this city and there isn’t enough for tourists to do after dark,” he said. But will tourists feel welcome? A local Islamic group ruffled feathers in June after issuing a “dress code” for foreign tourists. Abdullah said he was on a tourism drive “for no other reason than the fact that I need to stimulate the economy”. J&K’s finances are in a dire state after more than two decades of turmoil. The state receives just £72m each year in taxes and yet the salary bill for the 500,000 public employees is £155m, he claimed. Add a whopping pension liability plus millions on electricity subsidies and it is clear why he needs to find more public-sector jobs, fast. For now, though, he is just cautiously pleased to see tourists back. The man tasked with bringing peace to Kashmir was not born in the troubled valley, but in Essex, in Westcliff-on-Sea in 1970. This quiet, measured man is the product of a love affair between an Indian doctor and a British nurse, who met working at a hospital in Great Yarmouth. But Omar Abdullah has long shaken off any Essex accent, his family having moved back to India when he was just five. His father, Farooq Abdullah, left the medical profession to move into politics, eventually serving as chief minister three times between 1982 and 2002. Omar’s grandfather, Sheikh Abdullah, also held down the same job, spending time in jail for advocating Kashmiri independence. All three men have represented the National Conference, the largest political party in the northern Indian state of Jammu and Kashmir. These days, the party campaigns for more devolved powers from Delhi rather than full-blown independence. When Omar took office in 2009, hopes were high that this political princeling could heal the ravaged state. But he disappointed many by failing to quell violent uprisings in the summers of 2009 and 2010. The jury is out on whether he can take any credit for the relative calm that has reigned in his state for the past two years. A modest pragmatist, he said this week that “organisational fatigue” had as much to do with the quiet than any of his measures. In other words: the militants and stone-throwers got fed up. He is similarly blunt about India’s chances of becoming a superpower. Abdullah said he cheered along Team GB in London, as well as his national side, and says he likes British food (his mum, Mollie, does a “mean Sunday roast”, apparently). He is a regular visitor to the country of his birth, relishing the freedom anonymity brings. In J&K he is always flanked by bodyguards and travels in a convoy of at least nine cars. In Britain, he whizzes down the M25 all alone with no care in the world – probably listening to Abba, his favourite band. So strong is his love for the Swedish quartet that he happily admits to watching Mamma Mia in the West End. Four times. What is Kashmir like to visit? Stepping out of the terminal at Srinagar airport, it is clear you have not arrived in a typical tourist resort. Surrounded by camouflaged army barracks and guarded by an unusually large number of unsmiling armed soldiers, it feels more like a military installation than a tourist hotspot-in-waiting. The fact that draconian security measures will probably prevent your foreign mobile phone from working – or indeed any pay-as-you-go sim bought outside Jammu and Kashmir – adds to the unsettling feeling. Driving through the streets of the state’s summer capital, police officers and paramilitaries sometimes seem to outnumber civilians; barbed wire still keeps people away from sensitive locations and manned military bunkers are still stationed at certain key junctions. But all this will be forgotten when you make it up to Pari Mahal, the terraced mughal garden on the Zabarwan mountain, and catch your first glimpse of lake Dal. This 7 square miles of freshwater was made famous in the 60s when George Harrison learned to play sitar on one of the hundreds of wooden houseboats bobbing around the shore. Still very popular today, these romantic vessels have names such as Helen of Troy or Mona Lisa and are responsible both for much of the lake’s charm – and also its pollution. Green algae covers large swaths of the water, feeding off the untreated sewage dumped by all too many of the boats. Outside of Srinagar, the state of Jammu and Kashmir has much to offer. particularly in the high-altitude desert region of Ladakh in the north, which has a lunar quality. Motorcyclists love the road to the city of Leh, as it goes through many high passes including Fotu-La, which is 4,108 metres above sea level. Another summer highlight is Sonamarg, some 60 miles from Srinagar, a blooming valley full of alpine flowers, backed by snow-capped mountains.